I've seen people who are hungry to be unified around some basic common issues, and it's made me proud. 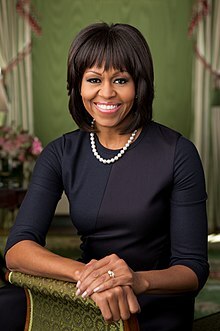 Michelle LeVaughn Robinson Obama (born January 17, 1964) is an American lawyer who is the wife of Barack H. Obama II, the 44th President of the United States of America. We need big change — not just the shifting of power among insiders. We need to change the game, because the game is broken. All I have to do is look into the faces of my children, and I realize how much work we need to do. What we've learned over this year is that hope is making a comeback. It is making a comeback. Translating hope into action is something Barack has done for his entire career. If Princeton hadn’t found my brother as a basketball recruit, and if I hadn’t seen that he could succeed on a campus like that, it never would have occurred to me to apply to that school — never. A lot of young people think they're invincible, but the truth is young people are knuckleheads. To Mom, Dad, Craig and all of my special friends: Thank-you for loving me and always making me feel good about myself. My experiences at Princeton have made me far more aware of my "Blackness" than ever before. I have found that at Princeton, no matter how liberal and open-minded some of my White professors and classmates try to be toward me, I sometimes feel like a visitor on campus; as if I really don't belong. Regardless of the circumstances under which I interact with Whites at Princeton, it often seems as if, to them, I will always be Black first and a student second. By actually working with the Black lower class or within their communities as a result of their ideologies, a separationist may better understand the desparation [sic] of their situation and feel more hopeless about a resolution as opposed to an integrationist who is ignorant to [sic] their plight. I am desperate for change — now — not in 8 years or 12 years, but right now. We don’t have time to wait. We need big change — not just the shifting of power among insiders. We need to change the game, because the game is broken. When I think about the country I want to give my children, it’s not the world we have now. All I have to do is look into the faces of my children, and I realize how much work we need to do. Barack is one of the smartest men we will see in our lifetime. You can't handle goody bags. Let me explain the goody bag thing. You have to go into the party store and choose the bags. Then you have to choose what to put in the bags, and what is in the boys' bags has to be different from what is in the girls' bags. You'd walk in there and wander around the aisles for an hour, and then your head would explode. What we've learned over this year is that hope is making a comeback. It is making a comeback. And let me tell you something — for the first time in my adult lifetime, I'm really proud of my country. And not just because Barack has done well, but because I think people are hungry for change. And I have been desperate to see our country moving in that direction and just not feeling so alone in my frustration and disappointment. I've seen people who are hungry to be unified around some basic common issues, and it's made me proud. He is going to demand that you shed your cynicism. That you put down your divisions. That you come out of your isolation, that you move out of your comfort zones. That you push yourselves to be better. And that you engage. Barack will never allow you to go back to your lives as usual, uninvolved, uninformed. Barack has lead by example. When we took our trip to Africa and visited his home country in Kenya, we took a public HIV test—for the very point of showing folks in Kenya that there is nothing to be embarrassed about in getting tested. We have this window of opportunity; we have a chance to make something real happen. Something possible happen, to live beyond our fear, think about that, and help us. Barack and I talked long and hard about this decision. You know, this wasn’t an easy decision for us, because we’ve got two beautiful little girls, and we have a wonderful life, and everything was going fine. And there was nothing that would have been more disruptive than a decision to run for President of the United States. And as more people talk to us about it, I mean the question came up again and again. What people were most concerned about: they were afraid. It was fear. Fear, again, raising its ugly head, in one of the most important decisions we would make. Fear; fear of everything. Fear that we might lose. Fear that he might get hurt. Fear that this would be ugly. Fear that it would hurt our family. Fear. But you know, the reason why I said yes was because I was tired of being afraid. I am tired of living in a country where every decision that we’ve made over the last ten years wasn’t for something, but it was because people told us we had to fear something. We had to fear people who looked different from us. Fear people who believed in things that were different from us. Fear of one another right here in our own backyards. I am so tired of fear. And I don’t want my girls to live in a country, in a world, based on fear. The thing that I want you all to remember: please, please, don’t base your vote, this time, on fear. Base it on possibility. Think. Listen. The game of politics is to make you afraid so that you don’t think. And what we need right now isn’t political rhetoric, it isn’t game-playing. We need leadership; we need people with judgment; we need decent people, people with common sense, people with strong family values. People who understand the world. We have this window of opportunity; we have a chance to make something real happen. Something possible happen, to live beyond our fear — think about that, and help us. Help lift us up, help us fight this fight to change — transform — this country in a fundamental way. This chance won’t come around again. Are we ready to believe in the power of our own voices? Are we ready to cast aside our fear and cynicism? Are we ready to work our hearts out to make our dream a reality? Are we ready to overcome? If we are truly ready, then now is the time. This one’s on us. We cannot afford to wait. We cannot afford to doubt. We cannot afford to make excuses. We have this moment of opportunity. And we need to seize it. I listened to the pastors and elders in my churches. I listened to my mother who stayed home to raise my brother and me. I listened to my father, who worked hard every day in a blue collar job; a man who sacrificed his dreams to put food on the table and put his children through college and leave a pension to support my mom when he passed away. I listened to my grandfather, who was from Georgetown, South Carolina. Like my mom and dad, my grandfather never went to college, but he was a proud man, a smart man, and he filled my brother and me with big dreams about the lives we could lead. He taught me that my destiny had not been written before I was born – that my destiny was in my hands. So these were the voices I was hearing growing up. And they gave me the strength and courage to overcome the doubt and fear I was hearing in other corners of my community. From classmates who thought a black girl with a book was acting white. From teachers who told me not to reach too high because my test scores were too low. And from well-meaning but misguided folks who said, “no, you can’t,” “you’re not smart enough,” and “you’re not ready.” Who said “success isn’t meant for little black girls from the South Side of Chicago.” And you know what? When I listened to my own voice and cast the cynics aside, when I forged ahead and overcame the doubts and fears of others about who I was and what I could become, I found that their doubts and fears were misplaced. Funny thing, the more I achieved, the more I found that I was just as ready, just as qualified, just as capable as those who felt entitled to the seat at the table that I was working so hard for. And I realized that those who had been given the mantle of power in this country didn’t have any magic about them. They were no better, no smarter than me. That gnawing sense of self-doubt that is common within all of us is a lie. It’s just in our heads. Nine times out of ten, we are more ready and more prepared than we could ever know. Barack believes in the greatness of America. He’s seen it in his own life’s journey. But he also knows that what’s holding us back is that our leaders have lost touch with the ideals that make this country great. Ideals like equality. Justice. Freedom from want and despair. And he believes that until we restore a sense of common destiny and shared purpose; until we understand that we are only as strong as the weakest among us; that there is more that binds us together than drives us apart; until we see ourselves in one another – until we truly care for all children; not just our own then we will continue to struggle with the problems that plague us. We’re going to have to dig deep into our souls, confront our own self-doubt, and recognize that our destiny is in our hands – that our future is what we make of it. So let’s build the future we all know is possible. Let’s prove to our children that they really can reach for their dreams. I’m asking you to believe in yourselves. I’m asking you to stop settling for the world as it is, and to help us make the world as it should be. As you might imagine, for Barack, running for president is nothing compared to that first game of basketball with my brother, Craig. People who work the day shift, kiss their kids goodnight, and head out for the night shift — without disappointment, without regret — that goodnight kiss a reminder of everything they're working for. Millions of Americans who know that Barack understands their dreams; that Barack will fight for people like them; and that Barack will finally bring the change we need. I can't tell you how much it means to have Craig and my mom here tonight. Like Craig, I can feel my dad looking down on us, just as I've felt his presence in every grace-filled moment of my life. At 6-foot-6, I've often felt like Craig was looking down on me too … literally. But the truth is, both when we were kids and today, he wasn't looking down on me. He was watching over me. I come here tonight as a sister, blessed with a brother who is my mentor, my protector and my lifelong friend. I come here as a wife who loves my husband and believes he will be an extraordinary president. I come here as a mom whose girls are the heart of my heart and the center of my world — they're the first thing I think about when I wake up in the morning, and the last thing I think about when I go to bed at night. Their future — and all our children's future — is my stake in this election. My dad was our rock. Although he was diagnosed with multiple sclerosis in his early 30s, he was our provider, our champion, our hero. As he got sicker, it got harder for him to walk, it took him longer to get dressed in the morning. But if he was in pain, he never let on. He never stopped smiling and laughing — even while struggling to button his shirt, even while using two canes to get himself across the room to give my mom a kiss. He just woke up a little earlier and worked a little harder. And you know, what struck me when I first met Barack was that even though he had this funny name, even though he'd grown up all the way across the continent in Hawaii, his family was so much like mine. He was raised by grandparents who were working-class folks just like my parents, and by a single mother who struggled to pay the bills just like we did. Like my family, they scrimped and saved so that he could have opportunities they never had themselves. And Barack and I were raised with so many of the same values: that you work hard for what you want in life; that your word is your bond and you do what you say you're going to do; that you treat people with dignity and respect, even if you don't know them, and even if you don't agree with them. And as our friendship grew, and I learned more about Barack, he introduced me to the work he'd done when he first moved to Chicago after college. Instead of heading to Wall Street, Barack had gone to work in neighborhoods devastated when steel plants shut down and jobs dried up. And he'd been invited back to speak to people from those neighborhoods about how to rebuild their community. People like Hillary Clinton, who put those 18 million cracks in the glass ceiling, so that our daughters — and sons — can dream a little bigger and aim a little higher. People like Joe Biden, who's never forgotten where he came from and never stopped fighting for folks who work long hours and face long odds and need someone on their side again. And in my own life, in my own small way, I've tried to give back to this country that has given me so much. That's why I left a job at a law firm for a career in public service, working to empower young people to volunteer in their communities. Because I believe that each of us — no matter what our age or background or walk of life — each of us has something to contribute to the life of this nation. And in the end, after all that's happened these past 19 months, the Barack Obama I know today is the same man I fell in love with 19 years ago. He's the same man who drove me and our new baby daughter home from the hospital 10 years ago this summer, inching along at a snail's pace, peering anxiously at us in the rearview mirror, feeling the whole weight of her future in his hands, determined to give her everything he'd struggled so hard for himself, determined to give her what he never had: the affirming embrace of a father's love. So tonight, in honor of my father's memory and my daughters' future — out of gratitude to those whose triumphs we mark this week, and those whose everyday sacrifices have brought us to this moment — let us devote ourselves to finishing their work; let us work together to fulfill their hopes; and let us stand together to elect Barack Obama president of the United States of America. Everywhere I've gone, in the people I've met, and the stories I've heard, I have seen the very best of the American spirit. Hadiya Pendleton was me and I was her, but I got to grow up and go to Princeton and Harvard Law School and have a career and a family and the most blessed life I could ever imagine. And Hadiya, we know that story. Just a week after she performed at my husband's inauguration, she went to a park with some friends and got shot in the back because some kid thought she was in a gang. Hadiya's family did everything right, but she still didn't have a chance. And that story, the story of Hadiya's life and death, we read that story day after day, month after month, year after year, in this city and around this country. So I'm not talking about something happening in a war zone, halfway around the world. I am talking about what is happening in the city that we call home. Now, just think about this for a moment: For generations, in many parts of this country, it was illegal for black people to get an education. Slaves caught reading or writing could be beaten to within an inch of their lives. Anyone — black or white — who dared to teach them could be fined or thrown into jail. And yet, just two years after the Emancipation Proclamation was signed, this school was founded not just to educate African Americans, but to teach them how to educate others. It was in many ways an act of defiance, an eloquent rebuttal to the idea that black people couldn’t or shouldn’t be educated. And since then, generations of students from all backgrounds have come to this school to be challenged, inspired and empowered. And they have gone on to become leaders here in Maryland and across this country, running businesses, educating young people, leading the high-tech industries that will power our economy for decades to come. In one Eastern Shore town, a teacher reported to work one morning to find that someone had smashed the windows of her schoolhouse. Other black schools across Maryland were burned to the ground. Teachers received death threats. One was even beaten by an angry mob. But despite the risks, understand, students flocked to these schools in droves, often walking as many as eight to ten miles a day to get their education. In fact, the educational association that founded Bowie State wrote in their 1864 report that — and this is a quote — “These people are coming in beyond our ability to receive them.” Desperately poor communities held fundraisers for these schools, schools which they often built with their own hands. And folks who were barely scraping by dug deep into their own pockets to donate money. But today, more than 150 years after the Emancipation Proclamation, more than 50 years after the end of 'separate but equal', when it comes to getting an education, too many of our young people just can’t be bothered. Today, instead of walking miles every day to school, they're sitting on couches for hours playing video games, watching T.V. Instead of dreaming of being a teacher or a lawyer or a business leader, they're fantasizing about being a baller or a rapper. Right now, one in three African American students are dropping out of high school. Only one in five African Americans between the ages of 25 and 29 has gotten a college degree; one in five. See, my parents didn't go to college, but they were determined to give us that opportunity. My dad was a pump operator at the city water plant, diagnosed with MS in his early thirties. And every morning I watched him struggle to get out of bed and inch his way to his walker, and painstakingly button his uniform, but never once did I hear him complain. Not once. He just kept getting up, day after day, year after year, to do whatever he could to give our family a better shot at life. Every day, you have the power to choose our better history — by opening your hearts and minds, by speaking up for what you know is right, by sharing the lessons of Brown versus Board of Education, the lessons you learned right here in Topeka, wherever you go for the rest of your lives. We know that today in America, too many folks are still stopped on the street because of the color of their skin, or they're made to feel unwelcome because of where they come from, or they're bullied because of who they love. As you go forth, when you encounter folks who still hold the old prejudices because they've only been around folks like themselves, when you meet folks who think they know all the answers because they've never heard any other viewpoints, it's up to you to help them see things differently. See, the truth is that if Princeton hadn’t found my brother as a basketball recruit, and if I hadn’t seen that he could succeed on a campus like that, it never would have occurred to me to apply to that school — never. And I know that there are so many kids out there just like me — kids who have a world of potential, but maybe their parents never went to college or maybe they’ve never been encouraged to believe they could succeed there. When I first arrived at school as a first-generation college student, I didn’t know anyone on campus except my brother. I didn’t know how to pick the right classes or find the right buildings. I didn’t even bring the right size sheets for my dorm room bed. I didn’t realize those beds were so long. So I was a little overwhelmed and a little isolated. Now young people can get insurance for as little as $50 a month, less than the cost of gym shoes. Today we’re celebrating the kind of music that makes you move no matter who you are or where you come from; music that taps into feelings and experiences that we all share — love and heartbreak, pride and doubt, tragedy and triumph. It is called soul music. Sometimes it makes your hips move. Sometimes it makes you rock your head. Sometimes it helps you just kick back and relax and soak it in. But no matter what form it comes in, you know this music always comes straight from the heart. You know you’re listening to someone who’s found her own unique voice, and isn’t afraid to show it to the world. And these women are perfect examples of just that. Every time I meet a child I think, who knows what’s going on in her life, whether she was just bullied or whether she had a bad day at school or whether she lost a parent — that interaction that we have with that individual, that child for that moment, could change their life … so we can’t waste this spotlight. It is temporary and life is short, and change is needed. And women are smarter than men. To all the young women here tonight, and all across the country, let me say those words again: Black girls rock! We rock! We rock! No matter who you are, no matter where you come from, you are beautiful, you are powerful, you are brilliant, you are funny! Let me tell you, I'm so proud of you. My husband, your president, is so proud of you. And we have such big hopes and dreams for every single one of you. When I look out at all these young women, I see myself. In so many ways your story is my story. As quoted in "Prince Harry has Tea with Michelle Obama at Kensington Palace" in Parade (16 June 2015); also in "Michelle Obama UK visit: 'When I look at young British Muslim women, I see myself'" by Mikey Smit, Mirror Online (16 June 2015) — the misquotation used in this particular headline was widely re-quoted as an actual quote of Michelle. I wake up in a house that was built by slaves. So when people ask me whether being in the White House has changed my husband, I can honestly say that when it comes to his character and his convictions and his heart, Barack Obama is still the same man I fell in love with all those years ago. And everywhere I've gone, in the people I've met, and the stories I've heard, I have seen the very best of the American spirit. I have seen it in the incredible kindness and warmth that people have shown me and my family, especially our girls. Every day, the people I meet inspire me, every day, they make me proud, every day they remind me how blessed we are to live in the greatest nation on earth. Serving as your First Lady is an honor and a privilege...but back when we first came together four years ago, I still had some concerns about this journey we'd begun. While I believed deeply in my husband's vision for this country...and I was certain he would make an extraordinary President...like any mother, I was worried about what it would mean for our girls if he got that chance. My father was a pump operator at the city water plant, and he was diagnosed with Multiple Sclerosis when my brother and I were young. And even as a kid, I knew there were plenty of days when he was in pain...I knew there were plenty of mornings when it was a struggle for him to simply get out of bed. Barack's grandmother started out as a secretary at a community bank, and she moved quickly up the ranks, but like so many women, she hit a glass ceiling. And for years, men no more qualified than she was – men she had actually trained – were promoted up the ladder ahead of her, earning more and more money while Barack's family continued to scrape by. But day after day, she kept on waking up at dawn to catch the bus...arriving at work before anyone else...giving her best without complaint or regret. And she would often tell Barack, "So long as you kids do well, Bar, that's all that really matters." Like so many American families, our families weren't asking for much. They didn't begrudge anyone else's success or care that others had much more than they did, in fact, they admired it. They simply believed in that fundamental American promise that, even if you don't start out with much, if you work hard and do what you're supposed to do, then you should be able to build a decent life for yourself and an even better life for your kids and grandkids. That's how they raised us; that's what we learned from their example. We learned about dignity and decency – that how hard you work matters more than how much you make...that helping others means more than just getting ahead yourself. We learned about honesty and integrity – that the truth matters, that you don't take shortcuts or play by your own set of rules, and success doesn't count unless you earn it fair and square. We learned about gratitude and humility – that so many people had a hand in our success, from the teachers who inspired us to the janitors who kept our school clean, and we were taught to value everyone's contribution and treat everyone with respect. Those are the values that Barack and I and so many of you are trying to pass on to our own children. That's who we are. And standing before you four years ago, I knew that I did not want any of that to change if Barack became president. Well today, after so many struggles and triumphs and moments that have tested my husband in ways I never could have imagined, and I have seen firsthand that being president does not change who you are. No, it reveals the you are. And if so many brave men and women could sacrifice their lives for our most fundamental rights, then surely we can do our parts as citizens of this great democracy to exercise those rights. Surely we can get to the polls on an election day and make our voices heard. ...if you truly wish to carry on the Oberlin legacy of service and social justice, then you need to run to, and not away from, the noise. Today, I want to urge you to actively seek out the most contentious, polarized, gridlocked places you can find. Because so often, throughout our history, those have been the places where progress really happens—the places where minds are changed, lives transformed, where our great American story unfolds. ... [ Franklin D. Roosevelt, Lucy Stone, Martin Luther King Jr. ]... didn’t let the ugliness and the obstacles deter them. They didn’t just give up and retreat to the comfortable company of like-minded folks, because they understood that this is how democracy operates. It is loud and messy, and it’s not particularly warm and fuzzy. ...Generation after generation, this country has become more equal, more inclusive, more fair, more free. My life and so many of your lives are a testament of that truth. But that has only happened because folks like all of you left their comfort zones and made their voices heard. ...the biggest, most dramatic change happens incrementally, little by little, through compromises and adjustments over years and decades. ...we live in such an instantaneous age. We want everything right away—whether it’s an Uber or your favorite TV show—and we want it tailored to our exact preferences and beliefs. We fill our Twitter feed with voices that confirm, rather than challenge, our views. If we dislike someone’s Facebook post, we just un-follow them, we un-friend them. ...in the real world, there are plenty of people who think very differently than you do, and they hold their opinions just as passionately. So if you want to change their minds, if you want to work with them to move this country forward, you can’t just shut them out. You have to persuade them, and you have to compromise with them. That is what so many of our heroes of history have done. [As graduates with] all the status and connections that degree confers, you don’t get to have no hands. No, you don’t get to be precious or cautious or cynical. No, not when the earth is warming and the oceans are rising. You don’t get to be cynical. Not when too many young people still languish in communities ripped apart by violence and despair. Not when women still make less than men for the same work. Not when millions of girls across the globe never set foot inside a school. (Applause.) No, not when many young people just like you — the men and women we honor this Memorial Day—have sacrificed their lives for your freedom to make your voice heard. You don’t get to have no hands. Instead of letting your hardships and failures discourage or exhaust you, let them inspire you. Let them make you even hungrier to succeed. I’m here tonight because I want to share with you just two fundamental lessons that I’ve learned in my own life, lessons grounded in the courage, love and faith that define this community and that I continue to live by to this day. Now, the first lesson is very simple, and that is, don’t ever be afraid to ask for help. And I cannot stress that enough. [...] See, when I started my freshman year at Princeton, I felt totally overwhelmed and out of place. I had never spent any meaningful time on a college campus. I had never been away from home for an extended period of time. I had no idea how to choose my classes, to — how to take notes in a large lecture. And then I looked around at my classmates, and they all seemed so happy and comfortable and confident. They never seemed to question whether they belonged at a school like Princeton. [...] as I got to know my classmates, I realized something important. I realized that they were all struggling with something, but instead of hiding their struggles and trying to deal with them all alone, they reached out. They asked for help. If they didn’t understand something in class, they would raise their hand and ask a question, then they’d go to professor’s office hours and ask even more questions. And they were never embarrassed about it, not one bit. Because they knew that that’s how you succeed in life. See, growing up, they had the expectation that they would succeed, and that they would have the resources they needed to achieve their goals. So whether it was taking an SAT-prep class, getting a math tutor, seeking advice from a teacher or counselor — they took advantage of every opportunity they had. So I decided to follow their lead. I found an advisor who helped me choose my classes. I went to the multicultural student center and met older students who became my mentor. And soon enough, I felt like I had this college thing all figured out. And, graduates, wherever you are headed, I guarantee you that there will be all kinds of folks who are eager to help you, but they are not going to come knocking on your door to find you. You have to take responsibility to find them. [...] And if someone isn’t helpful, if they are impatient or unfriendly, then just find somebody else. You may have to go to a second, or third, or a fourth person but if you keep asking. And if you understand that getting help isn’t a sign of weakness but a sign of strength, then I guarantee you that you will get what you need to succeed. And that brings me to the other big lesson that I want to share with you today. It’s a lesson about how to get through those struggles, and that is, instead of letting your hardships and failures discourage or exhaust you, let them inspire you. Let them make you even hungrier to succeed. Now, I know that many of you have already dealt with some serious losses in your lives. Maybe someone in your family lost a job or struggled with drugs or alcohol or an illness. Maybe you’ve lost someone you love [...]. [...] So, yes, maybe you’ve been tested a lot more and a lot earlier in life than many other young people. Maybe you have more scars than they do. Maybe you have days when you feel more tired than someone your age should ever really feel. But, graduates, tonight, I want you to understand that every scar that you have is a reminder not just that you got hurt, but that you survived. And as painful as they are, those holes we all have in our hearts are what truly connect us to each other. They are the spaces we can make for other people’s sorrow and pain, as well as their joy and their love so that eventually, instead of feeling empty, our hearts feel even bigger and fuller. So it’s okay to feel the sadness and the grief that comes with those losses. But instead of letting those feelings defeat you, let them motivate you. Let them serve as fuel for your journey. When someone is cruel or acts like a bully, you don’t stoop to their level. No, our motto is, when they go low, we go high. When crisis hits, we don’t turn against each other. No, we listen to each other, we lean on each other, because we are always stronger together. I realized that our time in the White House would form the foundation for who they would become and how well we managed this experience could truly make or break them. That is what Barack and I think about every day as we try to guide and protect our girls through the challenges of this unusual life in the spotlight, how we urge them to ignore those who question their father’s citizenship or faith. How we insist that the hateful language they hear from public figures on TV does not represent the true spirit of this country. How we explain that when someone is cruel or acts like a bully, you don’t stoop to their level. No, our motto is, when they go low, we go high. Hillary (Clinton) has spent decades doing the relentless work to actually make a difference in their lives. Advocating for kids with disabilities as a young lawyer, fighting for children's health care as first lady, and for quality child care in the senate. What I admire most about Hillary is that she never buckles under pressure. She never takes the easy way out. And Hillary Clinton has never quit on anything in her life. And when I think about the kind of president that I want for my girls and all our children, that is what I want. I want someone with the proven strength to persevere. Somebody who knows this job and takes it seriously. Somebody who understands that the issues of our nation are not black or white. It cannot be boiled down to 140 characters. Because when you have the nuclear codes at your fingertips and the military in your command, you can't make snap decisions. You can't have thin skin or a tendency to lash out. You need to be steady and measured and well informed. Hillary understands that the president is about one thing and one thing only, it’s about leaving something better for our kids. That’s how we’ve always moved this country forward, by all of us coming together on behalf of our children, folks who volunteer to coach that team, to teach that Sunday school class, because they know it takes a village. Heroes of every color and creed who wear the uniform and risk their lives to keep passing down those blessings of liberty, police officers and the protesters in Dallas who all desperately want to keep our children safe. People who lined up in Orlando to donate blood because it could have been their son, their daughter in that club. Leaders like Tim Kaine who show our kids what decency and devotion look like. Leaders like Hillary Clinton who has the guts and the grace to keep coming back and putting those cracks in that highest and hardest glass ceiling until she finally breaks through, lifting all of us along with her. Because of Hillary Clinton, my daughters and all our sons and daughters now take for granted that a woman can be president of the United States. Don’t let anyone ever tell you that this country isn’t great, that somehow we need to make it great again. Because this right now is the greatest country on earth! We cannot sit back and hope that everything works out for the best. We cannot afford to be tired or frustrated or cynical. I want to recognize all of you who are here in this audience. We have our educators, our leaders, our young people who have been with us since we launched Reach Higher back in 2014. Now, when we first came up with this idea, we had one clear goal in mind: We wanted to make higher education cool. We wanted to change the conversation around what it means and what it takes to be a success in this country. Because let's be honest, if we're always shining the spotlight on professional athletes or recording artists or Hollywood celebrities, if those are the only achievements we celebrate, then why would we ever think kids would see college as a priority? These men and women show them that those kids matter; that they have something to offer; that no matter where they're from or how much money their parents have, no matter what they look like or who they love or how they worship or what language they speak at home, they have a place in this country. And as I end my time in the White House, I can think of no better message to send our young people in my last official remarks as First Lady. So for all the young people in this room and those who are watching, know that this country belongs to you—to all of you, from every background and walk of life. If you or your parents are immigrants, know that you are part of a proud American tradition — the infusion of new cultures, talents and ideas, generation after generation, that has made us the greatest country on earth. If your family doesn't have much money, I want you to remember that in this country, plenty of folks, including me and my husband — we started out with very little. But with a lot of hard work and a good education, anything is possible — even becoming President. That's what the American Dream is all about. If you are a person of faith, know that religious diversity is a great American tradition, too. In fact, that's why people first came to this country — to worship freely. And whether you are Muslim, Christian, Jewish, Hindu, Sikh — these religions are teaching our young people about justice, and compassion, and honesty. So I want our young people to continue to learn and practice those values with pride. You see, our glorious diversity — our diversities of faiths and colors and creeds — that is not a threat to who we are, it makes us who we are. Do not ever let anyone make you feel like you don't matter, or like you don't have a place in our American story — because you do. And you have a right to be exactly who you are. But I also want to be very clear: This right isn't just handed to you. No, this right has to be earned every single day. You cannot take your freedoms for granted. Just like generations who have come before you, you have to do your part to preserve and protect those freedoms. And that starts right now, when you're young. When you encounter obstacles — because I guarantee you, you will, and many of you already have — when you are struggling and you start thinking about giving up, I want you to remember something that my husband and I have talked about since we first started this journey nearly a decade ago, something that has carried us through every moment in this White House and every moment of our lives, and that is the power of hope — the belief that something better is always possible if you're willing to work for it and fight for it. That's the kind of hope that every single one of us — politicians, parents, preachers — all of us need to be providing for our young people. Because that is what moves this country forward every single day — our hope for the future and the hard work that hope inspires. I want our young people to know that they matter, that they belong. So don't be afraid—you hear me, young people? Don't be afraid. Be focused. Be determined. Be hopeful. Be empowered. Empower yourselves with a good education, then get out there and use that education to build a country worthy of your boundless promise. Lead by example with hope, never fear. And know that I will be with you, rooting for you and working to support you for the rest of my life. Being your First Lady has been the greatest honor of my life, and I hope I've made you proud. She’s fundamentally honest — goes out there, speaks her mind, jokes. She doesn’t parse her words or select them with an antenna for political correctness. Occasionally, it gives campaign people heartburn. … She’s fundamentally honest — goes out there, speaks her mind, jokes. She doesn’t parse her words or select them with an antenna for political correctness. To describe it [Michelle Obama's 1985 thesis at Princeton University] as hard to read would be a mistake; the thesis cannot be "read" at all, in the strict sense of the verb. This is because it wasn't written in any known language. This page was last edited on 6 December 2018, at 22:10.